M cells in Peyer's patch epithelium conduct transepithelial transport of luminal antigens to cells of the mucosal immune system. 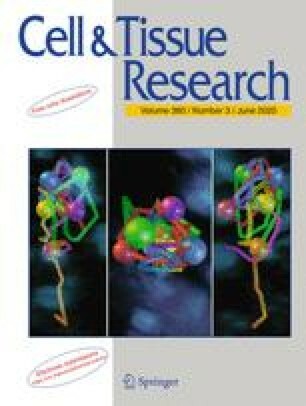 To determine the distribution of specific lectin-binding sites on luminal membranes of living M cells and to follow the transport route of membranebound molecules, lectin-ferritin conjugates and cationized ferritin were applied to rabbit Peyer's patch mucosa in vivo and in vitro. The degree to which binding enhances transport was estimated by comparing quantitatively the transport of an adherent probe, wheat germ agglutinin-ferritin, to that of a nonadherent BSA-colloidal gold probe. When applied to fixed tissue, the lectins tested bound equally well to M cells and columnar absorptive cells. On living mucosa, however, ferritin conjugates of wheat germ agglutinin and Ricinus communis agglutinins I and II bound more avidly to M cells. Absorptive cells conducted little uptake and no detectable transepithelial transport. Lectins on M cell membranes were endocytosed from coated pits, rapidly transported in a complex system of tubulocisternae and vesicles, and remained adherent to M cell basolateral membranes. Cationized ferritin adhered to anionic sites and was similarly transported, but was released as free clusters at M cell basolateral surfaces. When applied simultaneously to Peyer's patch mucosa, wheat germ agglutinin-ferritin was transported about 50 times more efficiently than was bovine serum albumin-colloidal gold.